3D reconstruction is an effective technology for studying and mapping external and internal features of the brain. As a part of the development of the Petromyzon marinus Neuroanatomy Database, led by Dr. Mihael Freamat, we have generated 3D reconstructions of the developing sea lamprey brain, with both rotating larval and parasitic brains shown at the left. White is showing the outline of the brains, pituitary glands, and pineal glands of both the larval and parasitic brain, while red is showing the preoptic area (POA) of each. 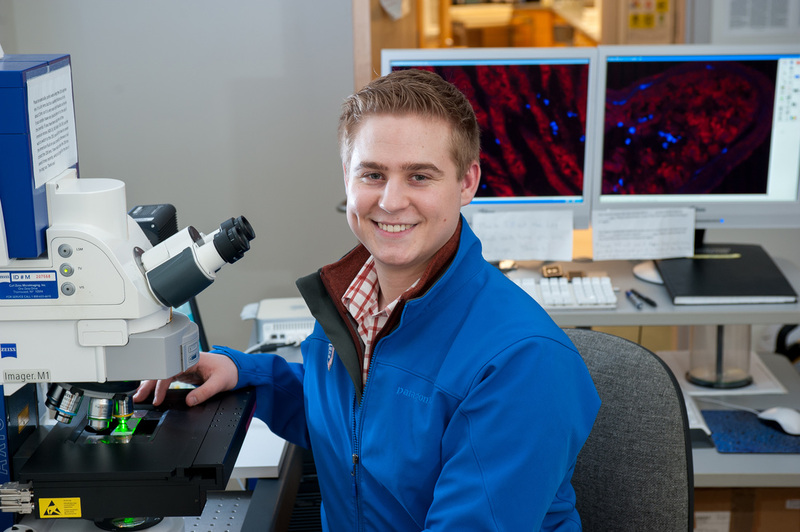 The Sower Laboratory considers the POA to be a region of the hypothalamus and is of interest for studying neurohormones, like gonadotropin-releasing hormone (GnRH), in the sea lamprey brain. To generate the 3D models, whole lamprey brains were sectioned on a cryostat and the sections were mounted onto slides. 2D images were collected of each section. Subsequently, all of the images were aligned in Inkscape. The brain and regions of interest were traced for each section. These 2D traces were interpreted ultimately as 3D brain reconstructions using the programs, Seg3D and Paraview. The Zeiss LSM 510 Meta laser scanning confocal microscope is used primarily by researchers in the biological sciences to image fluorescent probes in cells and tissues. However, confocal microscopes are finding increasing use in non-biological applications as well. This microscope is based on Zeiss' Axio Imager upright research microscope and is equipped with ICS optics for high image quality. The motorized microscope is supported by LSM 510 software which automatically identifies the microscope settings and the objectives used and which controls all movements and measurements carried out by the system with high precision. Unlike conventional fluorescence microscopes, the confocal microscope can collect in-focus fluorescence from thin optical slices within relatively thick specimens (typically at least 100 um for biological). The automatic collection of z-stacks (a series of images taken at different focal planes) within such relatively thick samples allows 3-D images, animations, and maximum intensity projections (brightest pixels from z-stack combined in a single image) to be generated. The Meta detector on the Zeiss instrument allows the distribution of multiple fluorophores with overlapping emission spectra to be imaged within a single sample and can be used while collecting z-stacks. The confocal was funded through a National Science Foundation Major Research Instrumentation (MRI) grant (#0618719). A transmission electron microscope is used to characterize the microstructure of materials with very high spatial resolution. Information about the morphology, crystal structure and defects, crystal phases and composition can be obtained. 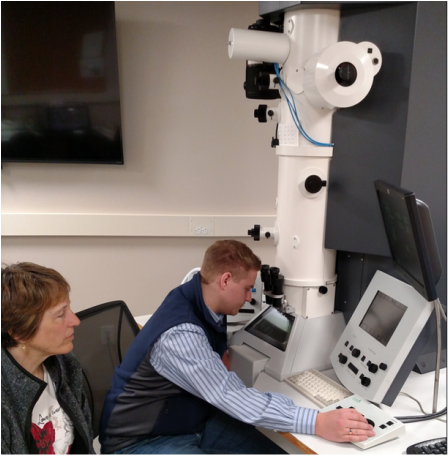 A Transmission Electron Microscope (TEM) is available in the Electron Microscopy Facility (Kendall Hall). The Zeiss/LEO 922 Omega TEM is a research microscope with accelerating voltages of 120 and 200kV and has magnification from 80X to 1,000,000X with a resolution line of 0.12nm. The in-column energy filter allows researchers to look at unstained or faintly stained materials and tissues. The high resolution objective lens allows the user to tilt a single-grid specimen holder plus or minus 15 degrees.